Copenhagen Fashion Summit is the leading sustainability event in fashion, bringing leaders together from around the world to discuss, mobilize and develop the future of the industry! This year I had the honor to be able to attend the event on the 15th and 16th of May 2018. It was an incredible experience that opened my eyes to the world of innovation and connected me further to the groundbreaking work of sustainability and fashion. This year, as an addition to the panel discussions, Copenhagen Fashion Summit has created the Innovation Forum which connects new innovators with top leaders in the fashion industry. “The fashion industry currently lacks the knowledge and transparency on what sustainable solutions exist, along with the capabilities to evaluate which to invest in”. To change this, they created the forum to be a direct connector for the industry. While at the event, I had the opportunity to explore this forum and choose 3 of my favorite innovations there! COLORZEN is a breakthrough technology that is developing to reinvent the cotton dyeing process, to become more efficient, environmental and economical. Today, cotton is the most popular fabric on the planet, yet our dying process is outdated, toxic and flawed. “ColorZen offers a simple, yet holistic solution by applying a patented treatment to raw cotton, resulting in a dyeing process that uses far less water, energy, and toxic dyes and chemicals”. 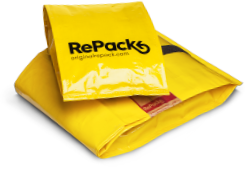 Repack is a reusable and returnable packaging service that can be used as a new system for e-commerce purchases. It creates a circular system through packaging that can be reused again and again. It is an opportunity for retailers and consumers who wish to demonstrate a commitment to sustainability. By replacing single-use packaging waste, retailers are able to minimize waste and demonstrate a circular economy. With a local presence, Mango Materials uses a closed-loop process to produce high-value, biodegradable biopolymers from low-cost, waste methane gas. Current they have a pilot plant located at a San Francisco Bay Area wastewater treatment plant, with their technology providing a market-driven solution for waste. To scale it, they envision to partner with brand owners within a value chain collaboration model, to co-develop innovative products. Overall, by treating methane as a valuable resource, we can help mitigate carbon emissions at wastewater treatment plants, landfills, and agricultural facilities.